We were, of course, delighted to download a Shackleton crossword but the murmurs of dismay began at once. “It’s carte blanche!” said the other Numpty (which, of course, if the grid is going to be symmetrically filled, isn’t a major problem) but then I read ‘The grid has mirror symmetry about the main diagonal (marked by blocks)’. That, to me, was slightly more worrying. I know it shouldn’t be, but I really find it difficult to mentally grasp that. Worse was to come! We now learned that ‘Clue numbers give the horizontal/vertical distance of the entries’ starting cells from the main diagonal’. There was to be an instruction and first letters of the down clue ‘part’ of each ‘tandem’ clue were going to give us a phrase from a song. We were also forewarned that there were to be four extra words hidden in the clues and that the answers to those clues were to be entered ‘in part symbolically’. Just one little hint there. That intriguing word ‘blocks’ and even their presence! Even I don’t need little black squares to tell me where the diagonal is – of course I know that it is where any desperate setter will hide his/her message – going from one corner to the other – so why those little black ‘blocks’? Anyway, that was enough to keep us going till midnight! I took a deep breath and checked that Shackleton’s membership of that elite toping club has survived the years: of course it has! ‘Henry the fusty old drunk …’ gave us H and two obsolete words YE and HYE. The tandem clue continued ‘behind bar bought everyone drinks, initially about 8 or 12 pints’ Well, Cheers, Shackleton! HIN appeared after a little research. There was more! ‘Fly to Scotland? Possibly worker , stocked with wine …’ which gave us that old crossword setter’s favourite ASTI in BEE (BEASTIE), and only one clue further on, ‘Turn to vintage wine when penning new (obscure Listener) …’ which gave us T’ + RED around N(ew). The clues were just running with ale, vintage, red etc.! Oh but this solving was tough. We (well, the other Numpty actually) slowly solved, producing PARTAN, CYAN, PLAN, TWAS, APED, APOLLO, BEEGAH, EPOS, NAAM. I find it extremely difficult to solve clues that are tagged on to each other and desperately began to attempt to construct a grid. We were in luck, as ADMIRER/ HAS BEEN gave us the two clues that had to start in the corners since they were to begin 12 cells from the diagonals, and a lucky guess put NAAM and EPOS intersecting with them. PARTAN (which Mrs Bradford kindly gave us – in a crossword like this her ‘Crossword Solver’s Dictionary‘ is invaluable -) and CUMMER fitted with those but then I bungled and, full of joy because I had managed to solve a couple of gentle anagrams (SASHAYED and SEEMLIER), slotted them in too high in the grid. I wonder how many other solvers struggled as much as we did to get a grid fill! We had a stroke of luck, though. Feeding the letters we had, at the start of the ‘down’ parts of the tandem clues into TEA with a number of ????? gave what had to be the theme, ‘The animals went in two by two!‘ So that was why we had tandem clues and ‘Mixed Doubles’ and it wasn’t going to be a tennis court at all or Daisy on a bicycle made for two! Such a familiar song – was it Burl Ives who used to sing it, with the ELEPHANT and the KANGAROO and the outsize HIPPO getting stuck in the door? Hoorah, hoorah! With our almost full grid (and shortly after midnight – this one was really challenging!) we had to tease out the instruction and found that we had to FULLY EXTEND EACH BLOCK NSEW. Aah! Those blocks. I did that and produced a little set of quadrants. Almost at once, I found the necessary animals in them – well, five of the animals, ANT, WASP, BEE, ELEPHANT and KANGAROO, in the three numbered squares. Red herring time! Those letters had spelled out ZOO. 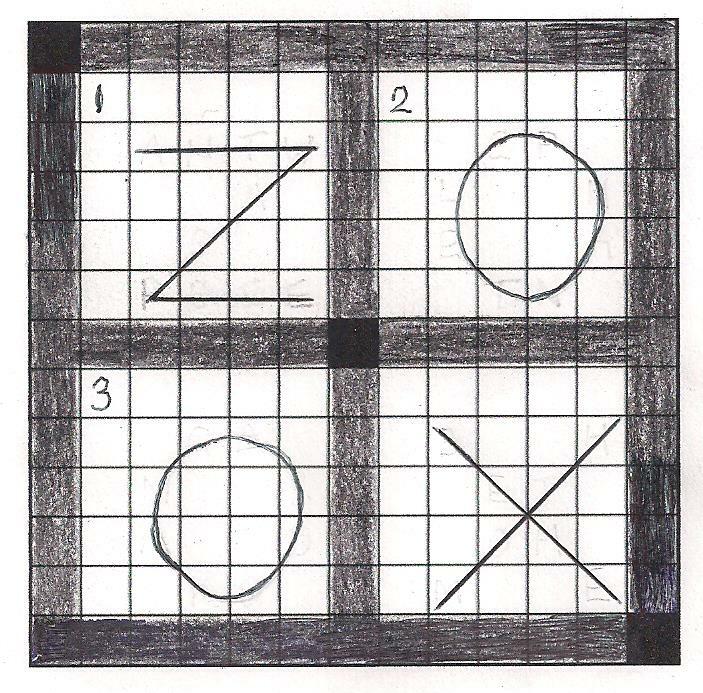 Wondering how to fit the HIPPOPOTAMUS into the fourth square (since we were told there were going to be six), we looked at the four words that were to guide us and saw that we had ZO (HYBRID and CROSS) and it seemed logical that STEER and BUFFALO would give us OX. Sure enough, putting an X into the same section of the fourth quadrant produced BEHEMOTH. 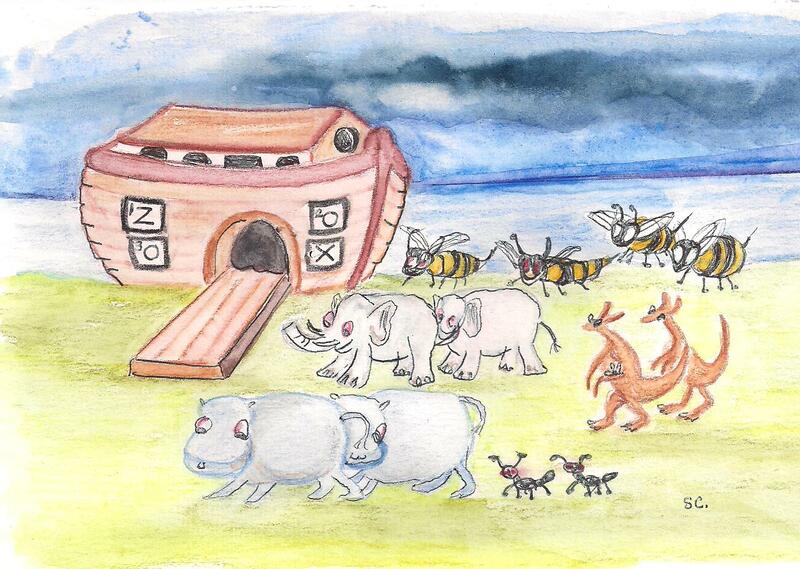 I went to bed, not quite convinced, as there was no 4 in that ‘Ark window’. When light dawned a few hours later, the full genius of Shackleton’s compilation dawned with it. We had a delightful little 2 X 2 crossword with just four clues! This was simply magic. Thank you, Shackleton! This entry was posted on 17 April 2015 at 4:02 pm	and is filed under Solving Blogs. Tagged: Mixed Doubles, Shackleton, Two by Two. You can follow any responses to this entry through the RSS 2.0 feed. You can leave a response, or trackback from your own site.